Fifteen hours after our first confident steps, the four of us shuffled off Pike’s Peak in disbelief. Somehow, Brian, Mary Karen, my husband and I had made it up and down one of the most famous mountains in Colorado. The Peak had not won, even though the mountain had tried her hardest. I guess this all began sometime last year when I had the brilliant idea that we’d hike together to the summit. Brian, Mary Karen, and their kids had finally settled into life in Colorado Springs. They had a nice house, a quiet life, and adventure in the Rockies whenever they wanted it. We had the perfect reason for a quick visit to see some of my husband’s oldest friends. The problem is, l like the adrenaline of extremes--especially on vacations. 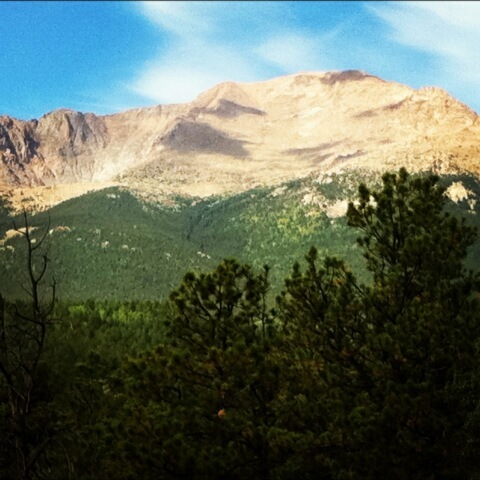 Pike’s Peak is 14,115 feet at the summit. It’s an extreme. At the time, this idea made a certain amount of sense. Brian had already climbed it once. We all work out: grueling runs, weights, regular hiking, yoga, and hours of spinning. We are not overweight and love the outdoors. We simply had to conquer Pike’s Peak, even if General Pike himself failed. It’s a famous mountain, and we deserved to traverse it together. If others could make it, why couldn’t we? It wasn’t lost on me what a unique group we made. One is a direct descendant of Chief Joseph Brant. One is a first generation American. One is a descendant of the folks who founded this place. One is named after a nun. Two are in the military. Two had just met in person after years of knowing each other online. Three have known each other longer than a decade. The morning of the hike, we set out with backpacks full of water, protein bars, sandwiches, first aid, cell phones, sunblock, jackets, and more. It seemed like a lot of stuff--so much that I wondered if we were over prepared. Surely we had too many supplies for a simple 13 mile hike up a mountain. I’ll spare you the details of the first eleven miles of this hike. We began around 7AM. For the most part, the first few miles were uneventful. We climbed when we needed to, stopped when we had to, and keep each other in our sights. I felt the air grow thinner as we increased our elevation, but the change in oxygen didn’t seem to hurt until we got to the tree line of the mountain. About that time, I started to feel like a kid in the middle of a severe asthma attack. By the final two miles, I could only take ten steps before I stopped to wheeze and gasp for air. No matter how much I filled my lungs, they could never fill up with what my body needed. My right hand went numb, face chapped, feet shuffled, and tongue swelled. I couldn’t cry or swallow. In short, my body and 13,900 feet (or so) just didn’t agree. Somewhere past the two mile marker, I looked down at my watch and truly took in the time. It was already almost 4PM. We were climbing that slowly. I felt my world constrict. There was no way we’d make the 4:40 train with 2 miles to go. The realization that we would miss our guaranteed way down the mountain sent me into a panic. 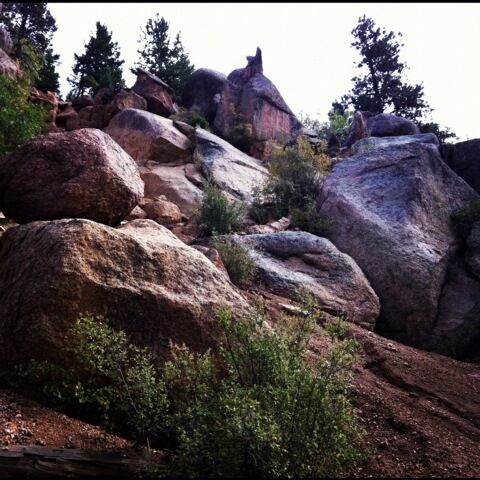 I sat on a stone on the side of the alpine terrain and looked out of Colorado. I couldn’t even enjoy the amazing view, and barely snapped a few photos on my iPhone. All I could think about was how to get off the mountain. We considered asking a family friend or neighbor to drive to get us, but heard the road would close a short time, leaving us all stuck. I thought about hitchhiking with someone already at the top. I considered calling a park ranger, but then heard from other hikers on the trail that could cost $100 to $500 a person. If we wanted off Pike’s Peak, we were going to have to climb down ourselves. Instead of pressing on to the summit, we turned around and started the long road down. We figured the sooner we started, the longer we’d have to beat the darkness and the cold. Friends, I did not begin this trek happily. While it is easier to descend a mountain than it is to ascend, the process still had its own challenges. Most of the pathway is gravel, with large boulders in some places and steep cliffs. One shuffling misstep can send you sliding down a huge embankment. We had plenty of food, but little water. Soon, the water ran out. We simply hadn’t planned for an almost 22 mile hike. We had packed for a 13 mile adventure. Three miles into the descent, I gave in to dehydration. It would prove to be a major limiting factor for all of us. My legs felt lethargic; it took extreme focus to lift each foot. My tongue tasted like a dry brick and my stomach felt like I would vomit at any second. I saw things a rational mind would have dismissed: Native Americans shaking their heads at me from deep within the trees, floating lights, and a mirage of the Barr Camp site. I said things I didn’t mean and told the group repeatedly to leave me, that I was destined to die on the mountain. I told them I didn’t care if I made it. Meanwhile, it was only getting later in the day. We stopped for some water at Barr Camp, enough for all of us to replenish, and enough for me to get some of the fluids I desperately needed. We rested for a short time but soon had to press on as twilight covered the mountain. The four of us still had around four miles to go when the darkness arrived. To see the path, we took turns using the flashlight apps on our cell phones. We had hiked slowly before, but the dark forced us to walk even slower. 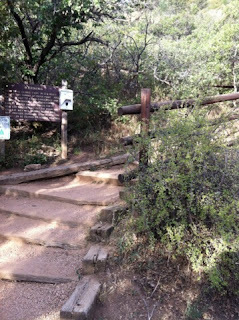 Each rock, root, bush or tree along the trail became a major hazard. That’s to say nothing of the wildlife on the mountain. Even though Brian assured us the mountain lions and black bears normally stayed away from the well-traveled path that did not guarantee we would not run into one or that an animal was not going to decide to follow us. We had three cell phones. The battery ran out on each one. We saved the last little bit of the battery on the final one in case we decided to call 911. All we had now was a small LED light Brian found in his backpack and the moonlight to guide us on the path. That was about the time my dehydration delirium gave way to extreme fear. Suddenly, our little band of four had turned into every scary movie cliché that ever existed in Hollywood. The four of us were inside a nightmare. And we had about two miles to go. All I could do was pray our ordeal would be over soon. I recited the Lord’s prayer in my head and focused as much as I could on old hymns I knew and familiar sayings from the Bible. At one point, I looked over at a flat rock and saw the face of Jesus. Looking back, I should have known then that we would make it off the mountain alive. After all, small miracles began happening all around me. My husband held my hand tighter than he ever has and propped me up as we took each careful step. Brian exhibited a calm leadership that would have made his ancestor proud. Mary Karen had night vision eyes she used to guide the group through the darkness. At about 11PM, we got to the end of the trail. I still felt so dehydrated I could hardly express how happy and elated I felt. We’d made it. We were alive. I sort of blankly stared at the others. Most people would look at me at tell me how stupid, silly, and unprepared we were. The first rule of hiking is to be smart. I get it. There were plenty of things I did wrong. I had trouble, in part, because I wasn’t ready for the conditions. I overextended myself and underestimated the mountain. But even as I kick myself for once again pushing myself to the ragged edge of crazy, I see lessons. When I think of things I can’t do (and there are plenty of things I am afraid I can’t do), I need to just stop it and realize that I can go further and last longer than I think. When times are tough and unexpected, I need to remember to not give up. You can’t achieve things in life without the help of others (I forget that sometimes). I’m a survivor. We are survivors. There is nothing I cannot conquer if I am willing to endure the uncomfortable. I’m fairly certain I’ll know Brian, Mary Karen, and my husband for the rest of my life. After all, we almost died together. No, it’s not that. We fought to live together.